Some time ago it occurred to me to wonder how the word incense came to mean both “a fragrant substance for perfuming the air”, and “to enrage,” two concepts that seem to be about as unrelated as it’s possible to be. But these two definitions of incense are indeed related, as a quick look at their etymology reveals. The connection is the burning. Incense is something you burn for its scented smoke, and to incense someone is to set them aflame with anger. Compare with fuming, another word that can describe a smelly fire, a fragrant perfume, and a furious person. Incendere, “to set on fire” is the same Latin root that gives us incendiary, of course, but it’s also in the same family as candere, “to shine,” which gives us candle, chandelier (by way of Old French), and incandescent. But candare goes still farther, and also gives us candid (as in “shining pure, white, and truthful”), and even candidate, not, alas, from the shining honesty of politicians, but from the shining white togas worn by candidates in ancient Rome. Let me share one more interesting related word, which comes from a Latin borrowing from Greek, from the Sanskrit branch of the same Proto-Indo-European root meaning “to shine, glow.” The sandal in sandalwood has nothing to do with footwear but comes from the burning of the wood for incense. 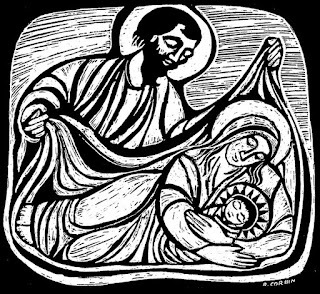 Here are a couple of lovely Christmas block prints by Rita Corbin (USA, 1930-2011) who worked with Fritz Eichenberg and Ade Bethune with the Catholic Worker movement. 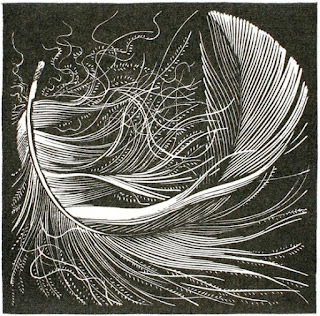 I can't find very good images of her work, or much information about their titles or dates, but I'll let a couple of them speak for themselves. 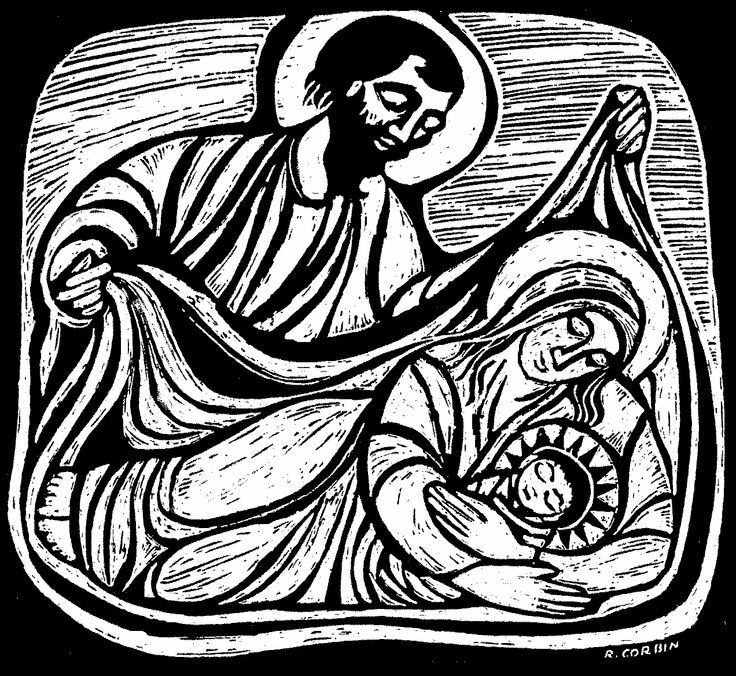 This first one is wonderfully tender, with Joseph caring for Mary and Mary embracing the baby. 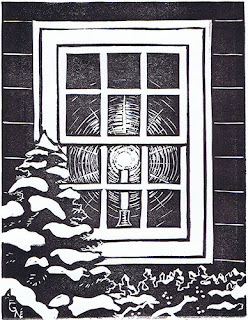 It’s a nice reminder of what this whole holiday is supposed to be about: letting Love be born into the world anew. 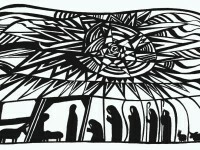 particularly exuberant star filling the entire sky above the Holy Family, wise men, and shepherds. However, it’s simple and bold enough to be appealing even in so small a thumbnail. To those who celebrate Christmas, may yours be full of love! The hourglass has probably been a symbol of time since its invention (which may have been in Alexandria, about 150 BCE). However, it also came to symbolize mortality, and as such was used on everything from elaborate vanitas paintings to pirates’ flags to gravestones, sometimes with wings added to show that time is fleeting. It is interesting that, unlike a clock, an hourglass simultaneously shows the time passing at the present instant, the past that has already flowed through, and the future remaining in the top bulb. And we can still see a little hourglass icon on our computers, flowing and flipping, flowing and flipping, while we wait for the computer to get something done. Before my last show, when I asked my family for suggestions of what block I should make to carve, my son P replied, “an hourglass,” no doubt inspired by the decorative one he keeps on his desk as a fidget toy. Obviously I was far from the first person to think of doing interesting things with the image of an hourglass; I quickly found cool art depicting hourglasses full of day and night, castles and universes, water and earth, people becoming smothered in falling sand… There were broken bulbs with little worlds escaping, hourglasses showing polar icecaps melting, and more. 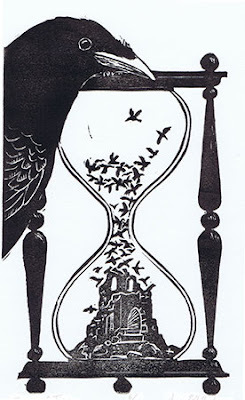 In fact, it appeared that all my first thoughts had already been done, so I cast about for something else to put inside an hourglass, and thought of birds. They can circle around scenic ruins, which is cool, and they can fly upward from the future to the past, which is cool. And as a bonus, they’re another play on “time flies.” So here it is. Hanukkah begins tonight, in honor of which here are a couple of wonderful wood block prints from an eighteenth century book of customs. 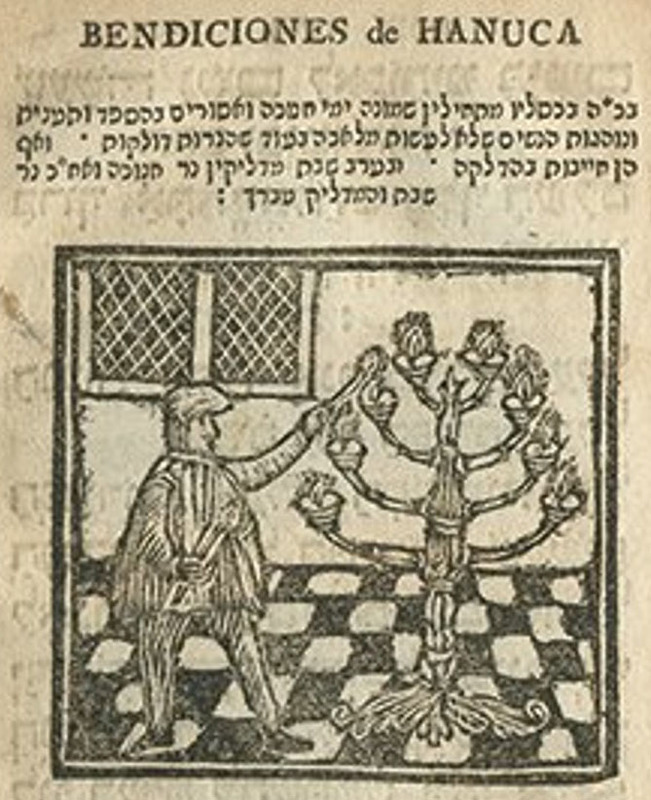 As far as I can make out from confusing citations, these wood block prints are from the same book, printed in Amsterdam in Hebrew and/or Yiddish and Spanish. 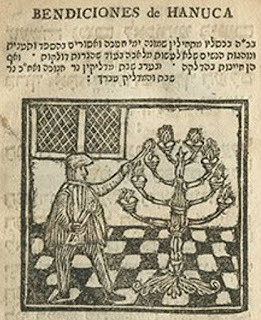 First, a man lighting a truly epic Hanukkah menorah. I certainly don’t know anyone with a menorah this big in their home! Interestingly, this one seems to have only the eight daily lights, not a ninth “servant” light, but the man is using his spills or candles double-fisted, apparently for maximum menorah-lighting speed and power. I like the way the checkerboard floor pattern sets the stage and gives some perspective and interest to the scene. Secondly, a very handsome illustration of a man blowing a shofar. We have the same checkered floor and diamond-paned windows, which give some nice texture to the scene. This time we have a small crowd of other people, and what looks like an open book. The text or musical notation in the book is carved as simple zig-zagged lines. Generally speaking, these wood block prints would be considered pretty crude, but I think they have an appealing vigor, and the first man in the crowd, behind the shofar-blower, has a quite nicely detailed face. For those who celebrate Hanukkah, may it be a happy one! I’m going to see a performance of “Man of La Mancha” this weekend, so here are a collection of wood block prints illustrating the supremely famous Don Quixote. “Man of La Mancha” is not just any old adventure; it’s about seeing the world not as it is, but as it ought to be. 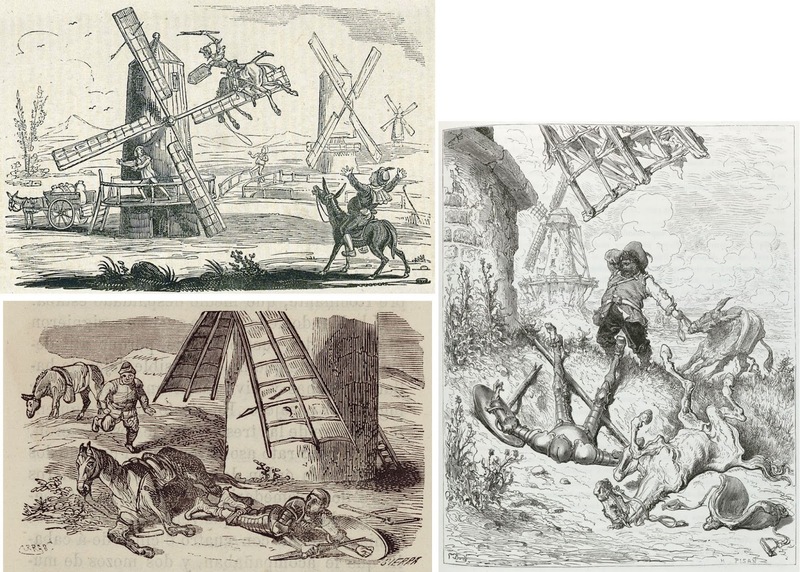 Admittedly, Don Quixote is nuts, and his illusions about the world are certainly not always helpful or even inspiring. Nevertheless, in the musical adaptation Don Quixote’s fantasies (with the sense of delusions) definitely have a lot in common with my sort of fantasy (with the sense of speculative fiction). That is, by inviting people to think in new, unconventional ways, both fantasies provide hope, creativity, and the possibility of making the world a better place. imaginations. 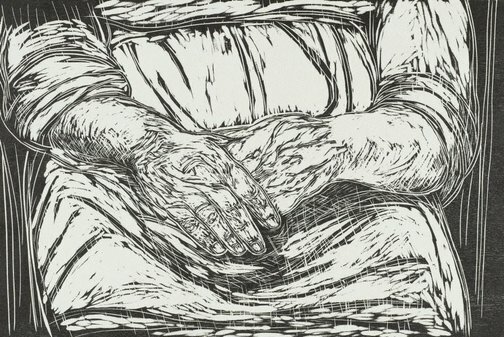 I’ve had a tough time winnowing down the possibilities to a manageable number, but here are some of my relief print favorites. We begin with one especially suited to “Man of La Mancha,” with its story-within-a-story about Cervantes imagining his characters. 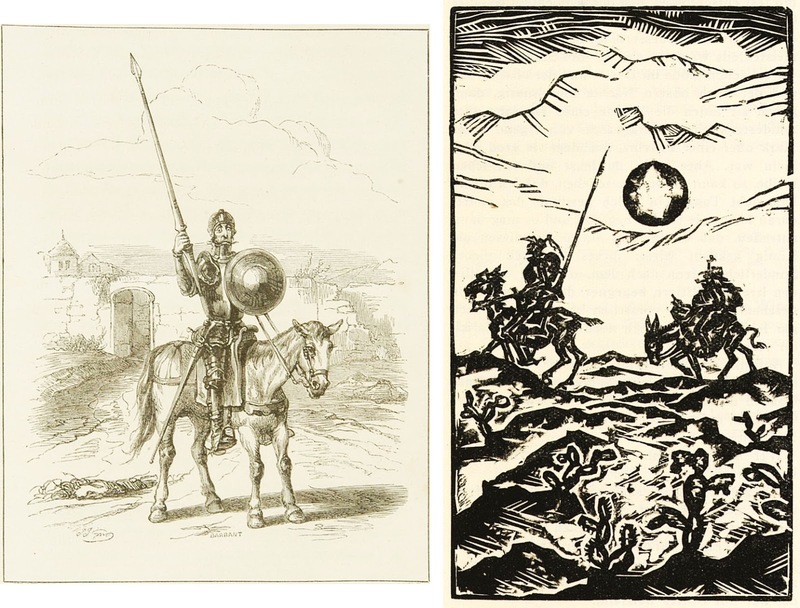 We follow up the image of the fictional characters in Cervantes’s imagination with an image of the fictional characters in Don Quixote’s imagination. I love the dreamy look in his eyes and the way it’s the pages of the open book that illuminate the world. Note, too, how Don Quixote holds the pages of the book with separate fingers, marking favorite passages to refer back to. It’s a nice detail. 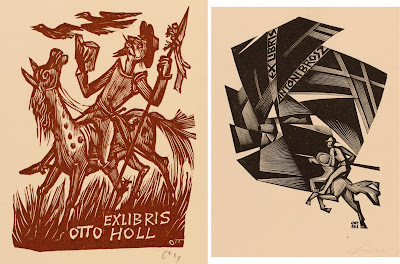 And so Don Quixote sallies forth in two very different styles of wood block print. The first, a very traditional wood block reproduction of a drawing, shows Quixote looking quite overwhelmed by the world, while the horse Rocinante just looks resigned. It’s a fun, whimsical depiction, with lots of personality. The second is too rough, and the figures too distant to have any facial expressions, but the carving itself is very expressive. It looks like a hot, dry, rough land indeed, and you can sympathize with Sancho’s - and the horse’s - resignation about their master’s whims. compose than a picture of a bloke just sitting on a horse. The illustration by George Cruikshank has his characteristic humor, with Quixote and horse lifted right up in the air, while Sancho and the other bystanders watch in horrified amazement. The next illustrations show the aftermath, Gustav Doré’s famous version continuing the comedy with all six victims’ legs ridiculously up in the air. The other takes a more sober approach, in which knight and charger will soon be able to drag themselves to their feet and set off once more. Finally, I include a couple of bookplates featuring Don Quixote. 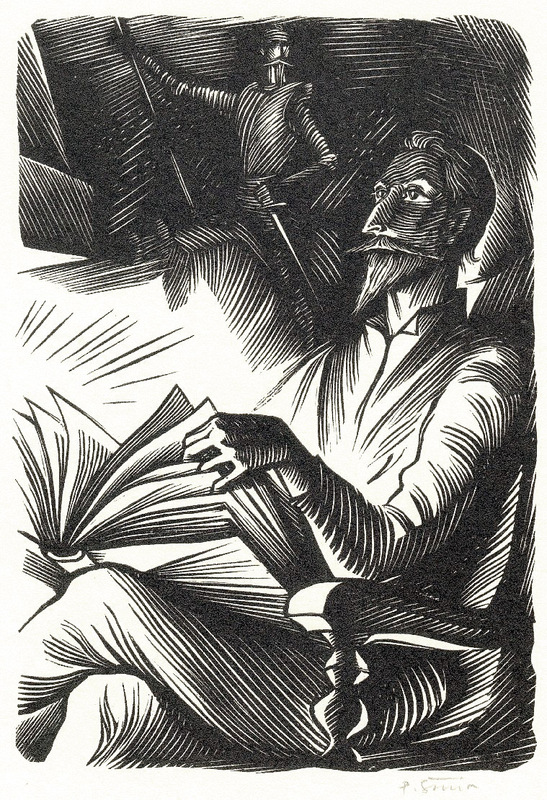 It turns out that Don Quixote was an incredibly popular theme for bookplates during the golden age of hand-carved exlibris, and I guess I shouldn’t be surprised. Again, what better symbol for book lovers than the man whose favorite books consumed his entire brain? The first is a charming image of Don Quixote reading while driving, with some nice little touches, such as the flowers on his lance. 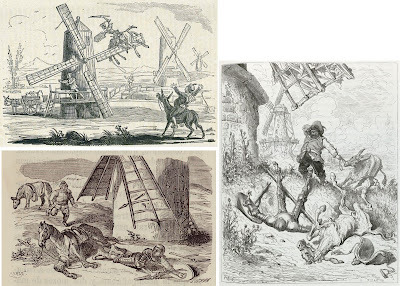 The second is an interesting modernist take in which the famous windmill looks more like a huge machine turbine and Don Quixote really looks quite strong and competent like one of Ferdinand Leger’s workers. There were plenty of pictures I had to leave out in order to keep this post to a manageable length, and while most were very traditional, a few took the imagery in some interesting - or strange - directions. But however you picture Don Quixote, it’s worth considering: what is that balance between seeing the world as it is, and imagining it as it could be? Between practicality and dreaming the impossible dream? Having mentioned last week the long, deep connection between writing and magic, this is a good time to share with you the inimitable Carl Sagan’s take on the matter. I am of the Carl Sagan “Cosmos” generation, a middle schooler when the show aired, watching it each week on PBS with my family. (My children don’t even understand the concept of watching a television show when it airs!) I confess that what I chiefly remember about “Cosmos” was how silly the dandelion spaceship looked, and Sagan counting like a whale: “Whoop! Haw haw haw haw haw…” So it would be disingenuous for me to claim that I remember and was inspired by this particular statement about books. Still, I can’t imagine that it didn’t please me at the time, seeing what an avid lover of reading, writing, and books I was. At any rate, much of our reading nowadays is not done with paper books made from trees, but that doesn’t change the magic. Indeed, is it not even a further height of magic that we can now send those funny dark squiggles instantaneously through the aether, to carry thoughts from mind to mind? Never doubt that there is magic in the world! Now let us be sure that we use the magic for good, not evil. Quotation from Carl Sagan, Cosmos episode 11, 1980. Everywhere I go, I keep my eyes open for beautiful scenes and interesting things. When I’m close to home or in “ordinary” places, I try to find the beauty that might be overlooked because of familiarity, and when I’m in more popularly acclaimed places, I try to look for unique details or less common perspectives. Yesterday I hung a solo show called “Around the World,” featuring twenty-five pieces depicting buildings, animals, scenes, and other details from ten states and eight countries. The pieces represent things that appealed to me on my travels, so they are both personal records of my own treasured journeys and universal celebrations of iconic places around the world. Each image is an invitation to visitors to the show to reminisce on their own travels, imagine new destinations, and notice and appreciate anew the places they visit every day. 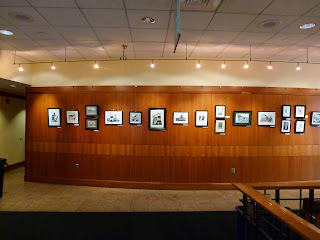 Today I started putting up my display for this weekend’s Mother Brook Open Studies. I’ll have to finish setting up tomorrow morning because I’m working down to the wire completing my preparations this time. 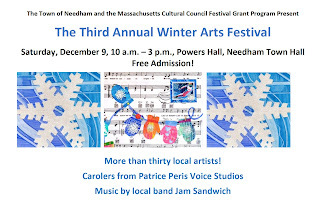 It should be a great event, though, with a wide variety of really interesting work, and demonstrations and activities, all in a single convenient location, a former school building in Dedham, MA. 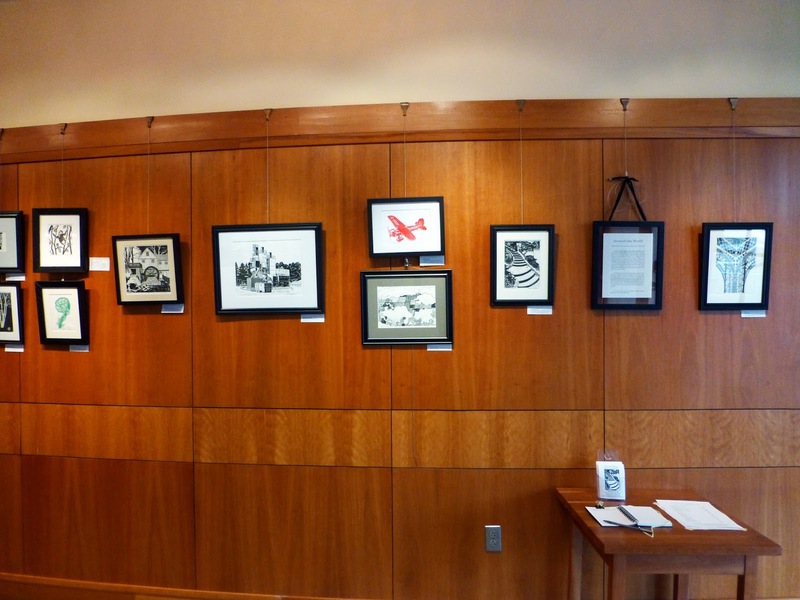 If you stop by the Wellesley Free Library, be sure to leave me a comment in the visitor’s book, and if you can make it to Mother Brook Open Studios, be sure to say hello. I’m in room 8 on the first floor. For anyone with a taste for linguistics, it’s easy to see that grammar is glamorous, but not everyone may realize that these words are not only connected, but connected in their magical power. Let’s start with grammar. From Latin, from Greek, this word originally comes from the word for the art of letters, or writing. You can see the same root in telegram and hologram, as well as its alternate form in autograph, cryptography, calligraphy, and many more. In English the word grammar referred only to Latin grammar until the sixteenth century, except that originally it also referred to all sorts of knowledge, especially occult knowledge and magic. After all, those same Latin scholars often studied the protosciences such as alchemy and astrology. 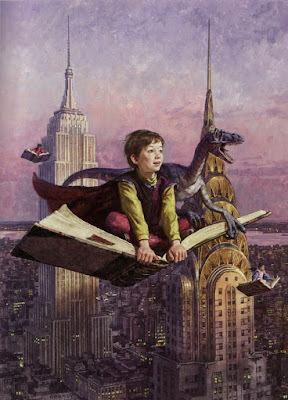 Even without that, the connection between writing and magic is long and deep. To those of us who take reading and writing for granted, writing may not seem anything out of the ordinary, but as Svarnil reminds Jiriya in Sleeping Legends Lie, writing is magic to those who cannot do it, and for most of history, that was most people. Writing, a powerful ability wielded by an elite few, has been considered to be magic in many cultures. An early fourteenth century variant of grammar, gramary or gramarye, was revived by Sir Walter Scott in its meaning of “magical arts”, and Scott (1771-1832) is also responsible for the introduction of glamour to mainstream English. Glamour was a Scottish dialectal word, a variant of the archaic gramary, and it meant “a spell or enchantment, especially an illusion.” It was most common in the phrase “to cast a glamour.” The meaning “magical beauty, alluring charm” dates back to 1840. After all, making something more attractive has to be one of the most popular uses of magic and illusion. 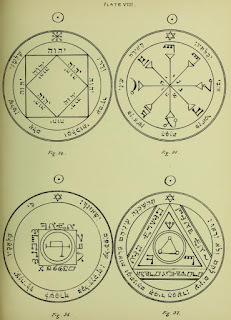 A grammar can also be the book that lays out the rules of a language, and naturally when grammar could mean “occult knowledge”, seventeenth century French developed the word into grimoire, a textbook of magic or a book of spells. English borrowed this word in 1849. 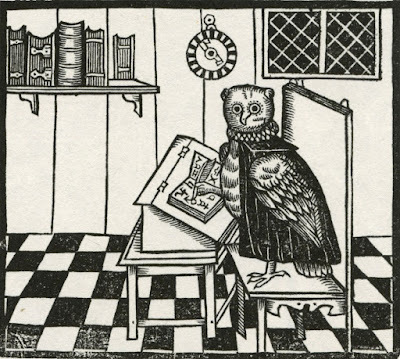 Nowadays you’re unlikely to run into the word grimoire, or the magical meanings of gramarye and glamour, unless you’re reading fantasy. Nevertheless, it’s always wise to remember that there is a glamour to grammar. Language does indeed have the power to perform magic: everything from casting illusions both good or evil, to changing the very substance of the world. 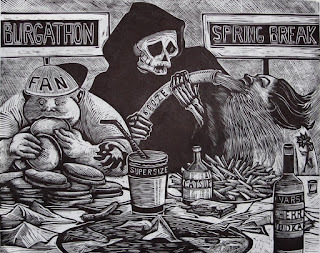 Having glorified pie in my last post, today seems a good day to look at how a handful of artists have explored the theme of gluttony in block prints. 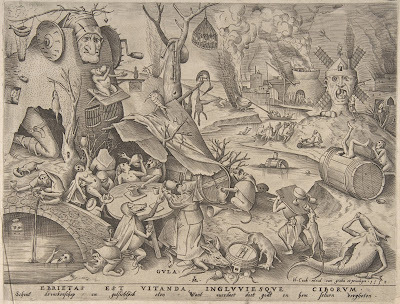 Not surprisingly, series of prints depicting the seven deadly sins were more popular five hundred years ago, but nevertheless, there’s an interesting diversity in the way the vice has been personified or represented. We begin with a fat belly and a long neck, the latter on the theory that having a long neck would allow you to enjoy your food all the way down, and the former on the theory that you’ve already eaten too much. 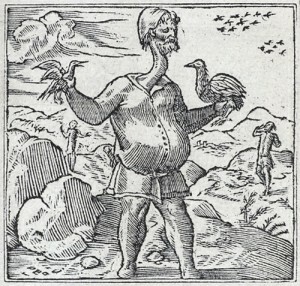 The birds are also apparently traditional symbols of gluttony, so clearly in the sixteenth century the phrase “to eat like a bird” would have meant something very different. Nowadays the animal that most symbolizes gluttony is the pig, and that was true back in the sixteenth century, too. 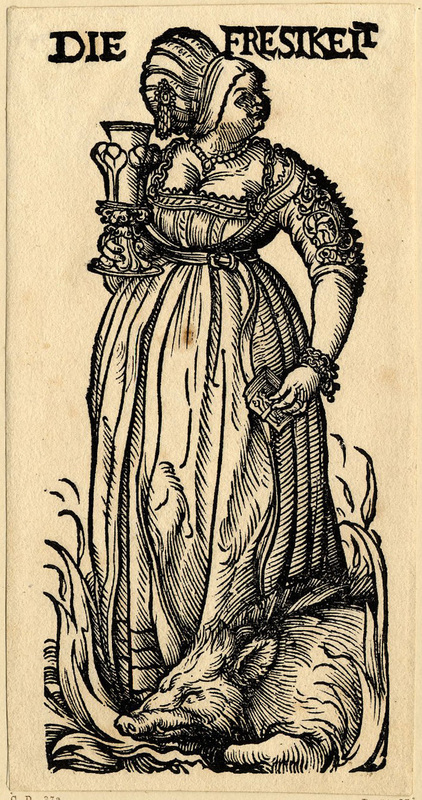 This comfortably plump woman is standing beside a pig, and holding a goblet and a pack of cards. Despite the flames (hellfire?) around her feet, she doesn’t look nearly so badly off compared with today’s gluttons gorging on burgers and booze. This twenty-first century image by James Todd includes the figure of death. After all, they are deadly sins, aren’t they? Some artists choose to imagine an embodiment of the vice itself, instead of the people who indulge in it, coming up with monsters of gluttony. 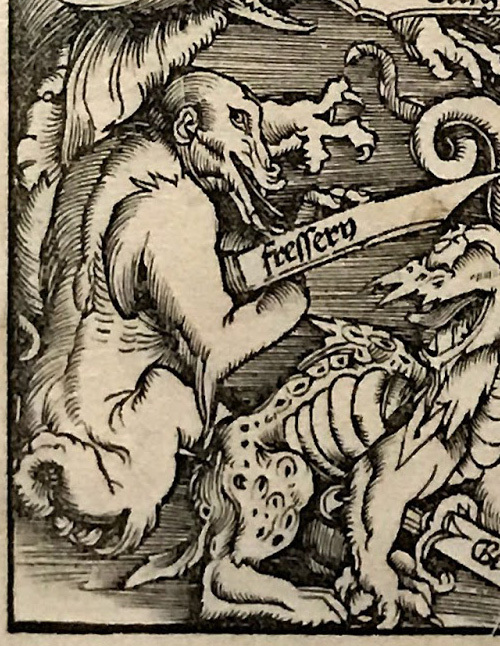 Hans Baldung’s monster looks avidly grasping, which seems plausible although it’s a different twist from the big bellies of our previous depictions. Certainly it looks like something you’d want to stay away from. And then there’s this straight up what-the-heck-? scene based on Bruegel’s work. 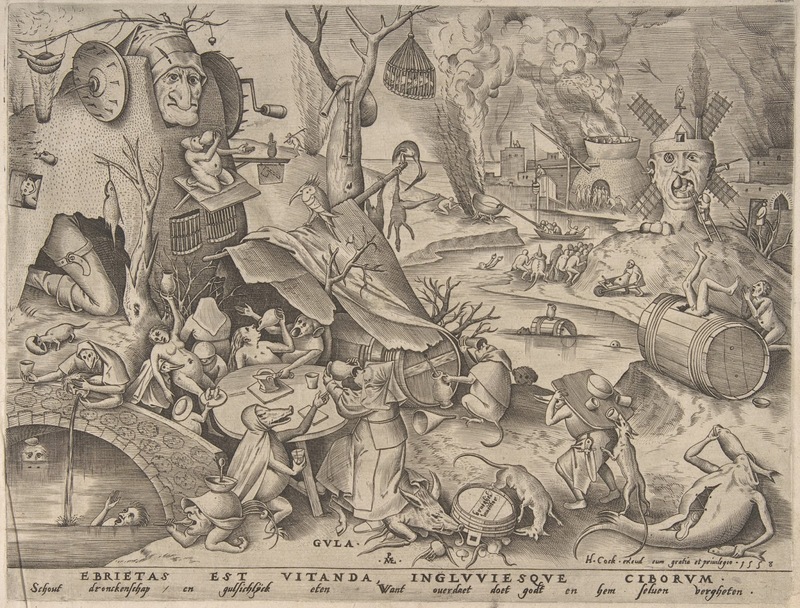 This piece is dense with allegory, and while the pig, the people guzzling from jugs, and the little man carrying his belly on a wheelbarrow are all perfectly straightforward, who knows what’s up with the windmill in the shape of a man’s head, the bagpipes slung over the tree, or the buildings on fire way in the background. 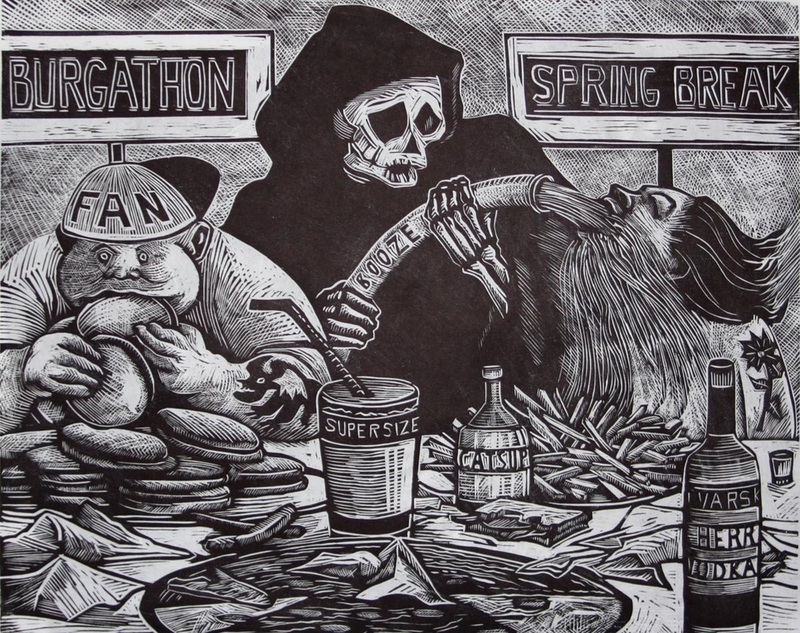 Gluttony can literally kill you in the form of addictions to drink or drugs, and all the health problems correlated with obesity, but that’s not why the deadly sins are called deadly. The idea is that gluttony is deadly to the spirit. How are we prone to gluttony now? 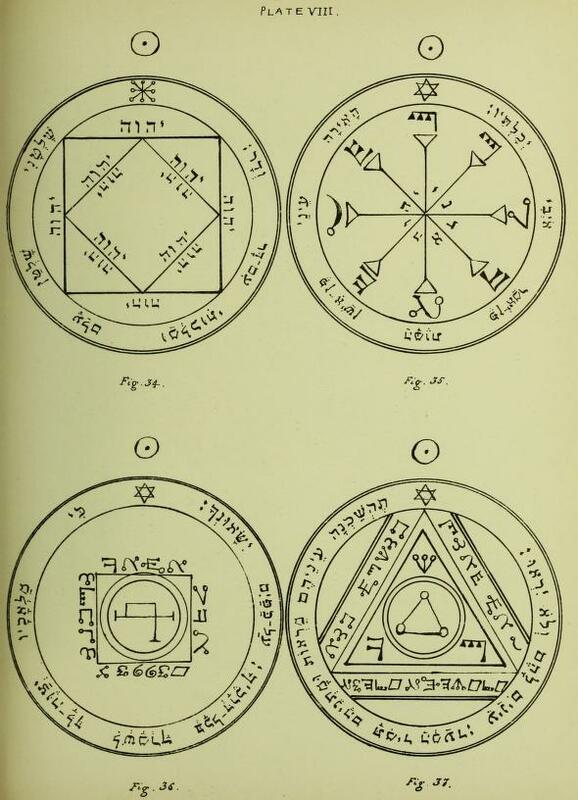 And do any of these prints still serve to illustrate that spiritual danger in a meaningful way? 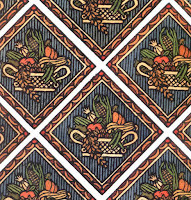 Here’s a lavish edition of Lydia Maria Child’s classic 1844 poem about Thanksgiving, illustrated with wood block prints. Yes, I’m always thankful for block prints! I’m one of those who learned the song with “woods” and “Grandmother’s house,” but I’m also one of those who lived in a place where snow at Thanksgiving was not all that unusual. 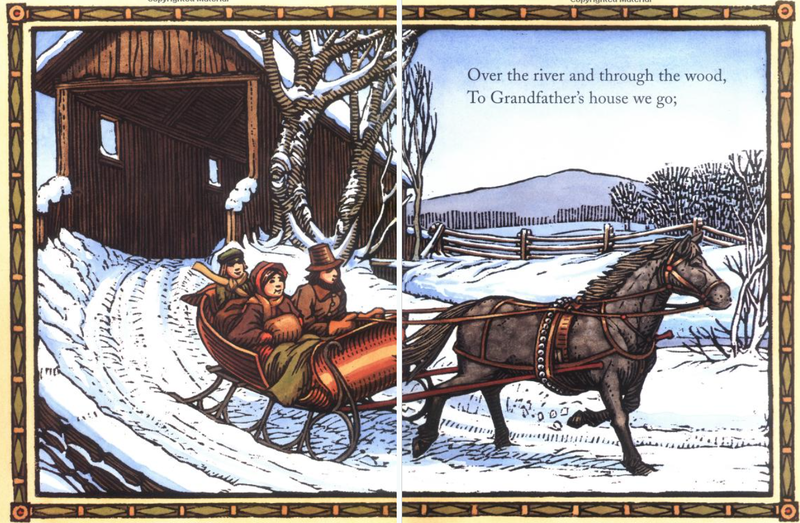 I only ever really knew the first and third verses, but had I known that in the fifth stanza Grandmother says, “The children are here, bring a pie for everyone” I would have found that quite inspirational! As for these wood block prints by Christopher Manson, they have that lovely punch of black carved wood over painted color. 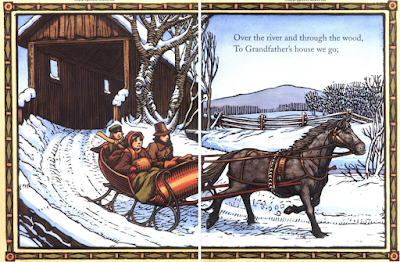 These illustrations are set in the original era, with period clothing and architecture to go with the old-fashioned references in the lyrics. I like the texture of the snow and trees, and the border around the picture. 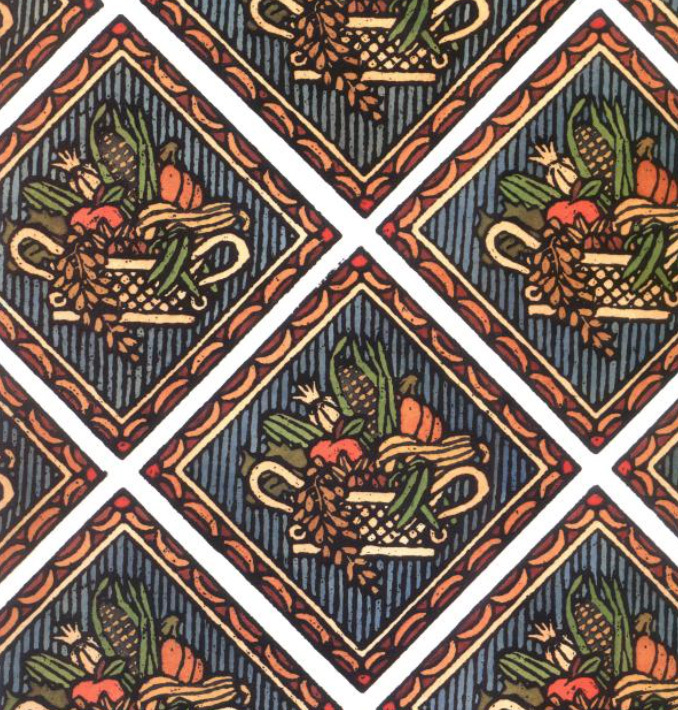 The book also has attractive endpapers with these lovely Thanksgiving baskets, a pleasing little block print, and a nice design detail. Then there’s the boy inspecting the pie, and as I alluded to earlier, Thanksgiving is all about the pies. I can identify with this boy. Turkey? Whatever. Pie is where it’s at. Manson’s little vignette captures the warmth and glow of a kitchen with hearth and oven for that crucial baking. 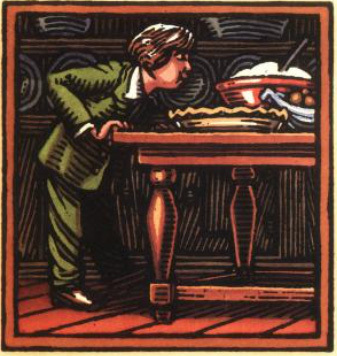 If you’ll be celebrating Thanksgiving this week, may you have much joy in family, friends, and food. Especially pies. 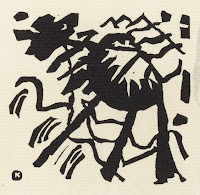 As we near Thanksgiving, here’s a wood block print of the harvest. Salvatore Zofrea (Italy/Australia, b. 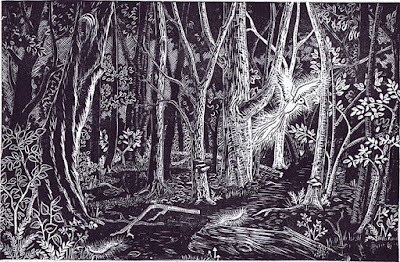 1946) has a distinctive technique in which his white figures have a black outline and a white outline. Clearly he first carves an outline of every shape regardless of whether it will eventually be up against a white or a black background. He then goes on to carve out white areas, carefully leaving their black outlines, thus giving them that double border. 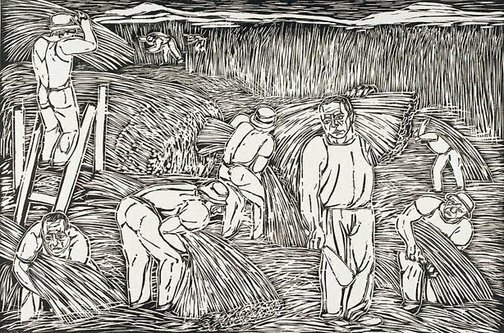 In this harvest piece there is an over-all texture of lines for the long stalks, growing, cut, gathered, fallen… everywhere. It certainly looks like hard work. I’ve included a second piece by Zofrea that I especially like, entitled “My mother’s hands.” I love how well the sketchy texture of the carving makes accurate details of wrinkles, veins, and skin. The close focus on the hands laid in the lap is quite lovely. This comes from a series of pieces illustrating the artist’s life. These are actually quite large pieces, for woodcuts. The harvest scene is 60x90 cm (24x 36 in). Seeing only small images on-line, it’s hard for me to get a sense of the impact they would have in person, at full size. Still, better a small view than none at all! far through the densely self-conscious poetickness. Of love or luxury bloomed around. Along the traveller's weary way. Having read this I was wondering why on earth Moore was famous. Then I saw that he was also the author of many of the classic sentimental Irish songs including “The Minstrel Boy,” “The Last Rose of Summer,” and “Believe Me if All those Endearing Young Charms.” So that explained his fame, but didn’t qualify him for a blog post about fantasy poetry. And then I saw that he was also the author of “The Song of Fionnuala,” (c. 1808) and here he is! 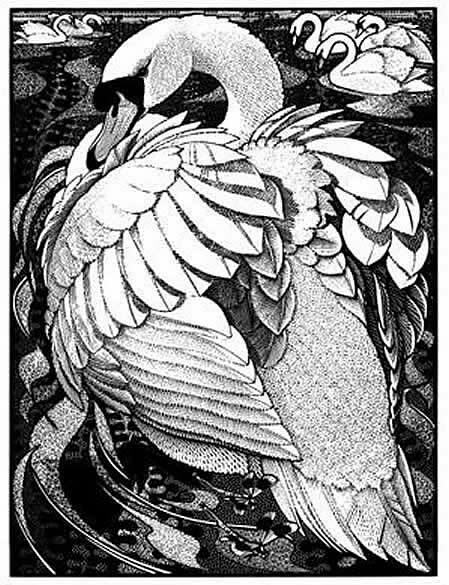 For the fantasy background, you need to know that this poem refers to Fionnuala, one of the four Children of Lir, a sea god of Irish mythology. The mother of Lir’s children was a daughter of the king of the gods, and when she died her father sent Lir another of his daughters as a replacement. Unfortunately, this second one was jealous of Lir and his children and cursed the four children into swans for 900 years. For 300 of those years they had to live on the Sea of Moyle. Here’s the first verse. Break not, ye breezes, your chain of repose! Sleep with wings in darkness furl'd? Okay, you may still be wondering what’s so great about this, but I first encountered it at the impressionable age of 9. I liked the tragic drama of the fairy tale, but I fell in love with the alliteration. Read it aloud with a little emotion and see if all that smooth, wonderfully interlocked alliteration doesn’t thrill you! Of course, Moore also has rhyme to add to the mix, making the words flow together even more voluptuously. Quite simply, this was the sort of stuff that turned me into a life-long lover of poetry and fantasy both. Art Show Season is in full swing, and I want to start getting out the word about a number of upcoming shows in which I’ll be participating. If you’re in the area, consider visiting one or two (or four) to have fun with your holiday shopping. These shows are a great opportunity to find unique and special gifts, buy local, and support the arts and artists while getting away from the computer screen without having to face the mall. 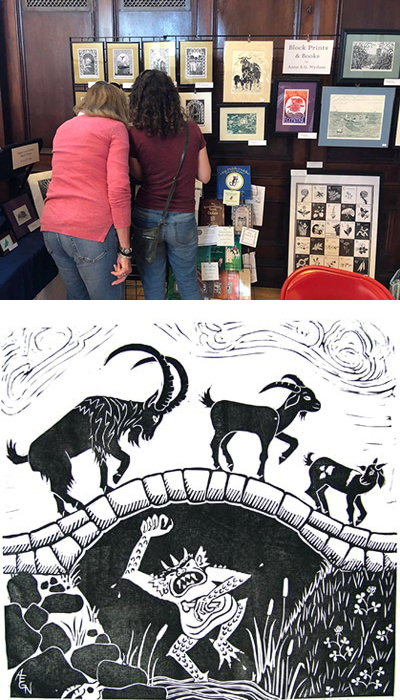 And even if you don’t want to buy a thing, local art shows are still a fun place just to see original arts and crafts, talk with the people who make them, and perhaps get inspired for your own projects. Most artists at shows are delighted to talk shop, and share tips and techniques. Next up for me, in one week, is the Village Fair at the Needham Congregational Church on November 18, from 9:30 - 3:00, plus another hour or two after the service on November 19. This will be the first time I’ve done this show in several years, since they’ve started having more emphasis on artists, so I’m curious to see how it goes. My daughter loves this event because it offers such a range of things, from hand-made original art including pottery, jewelry, painting, and of course block prints, to food and a bake sale, to a display of quite nice used items at rummage sale prices. There’s also a special area where very young children can select and wrap gifts for others without breaking very small budgets or ruining the surprise for family members. 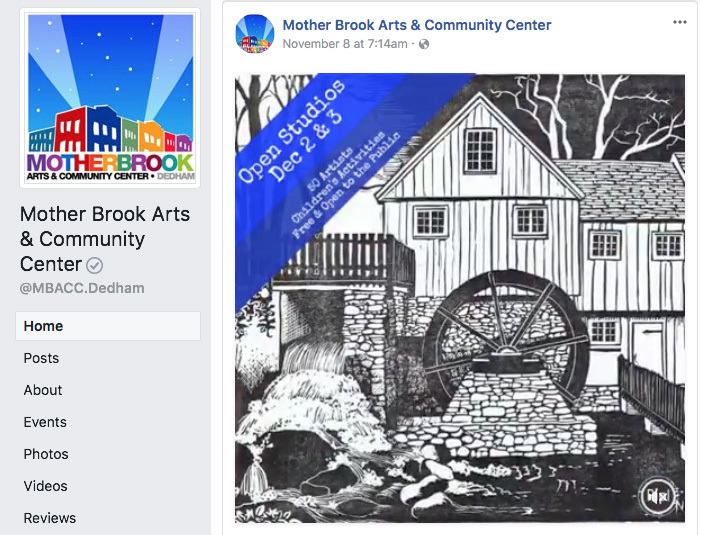 Two weeks after that, on December 2-3, from 11:00 - 5:00, will be Mother Brook Open Studios. This is the place for the more serious Art, including not just smaller works in a wide variety of media, but large scale oils, sculpture, and more. This is the show where I’ll have more space to display all my work instead of having to jam-pack as much as possible onto one table. November “holiday” sales notwithstanding, I just can’t go into Christmas mode until December — but as of Mother Brook Open Studios, it’s time to go wild with your Christmas shopping! And you will find some really amazing and gorgeous art at this event. 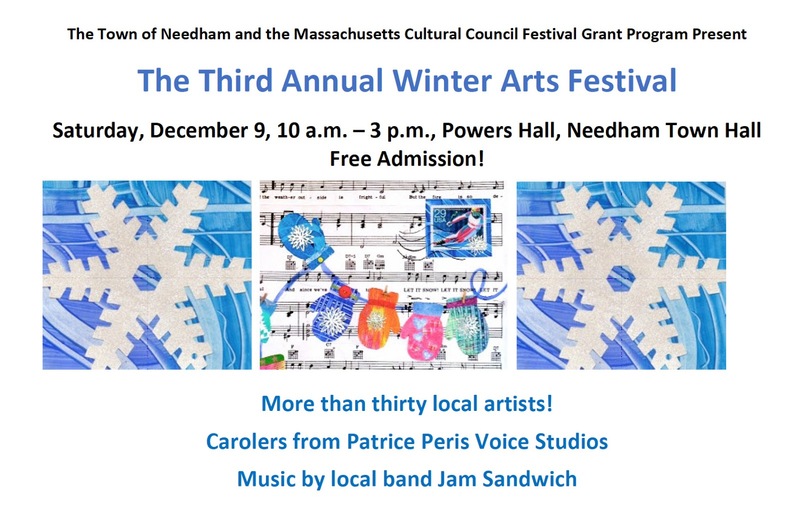 The following weekend, December 9, from 10:00 - 3:00, I’ll be at the annual Winter Arts Fest in Needham Town Hall, where there will be live music and lovely sunlight streaming into the beautiful hall. Okay, I can’t really guarantee the sunlight, but I can guarantee a variety of hand-made goods including candles, soaps, origami boxes, and recycled art, in addition to the usual array of jewelry, ceramics, and wall art. 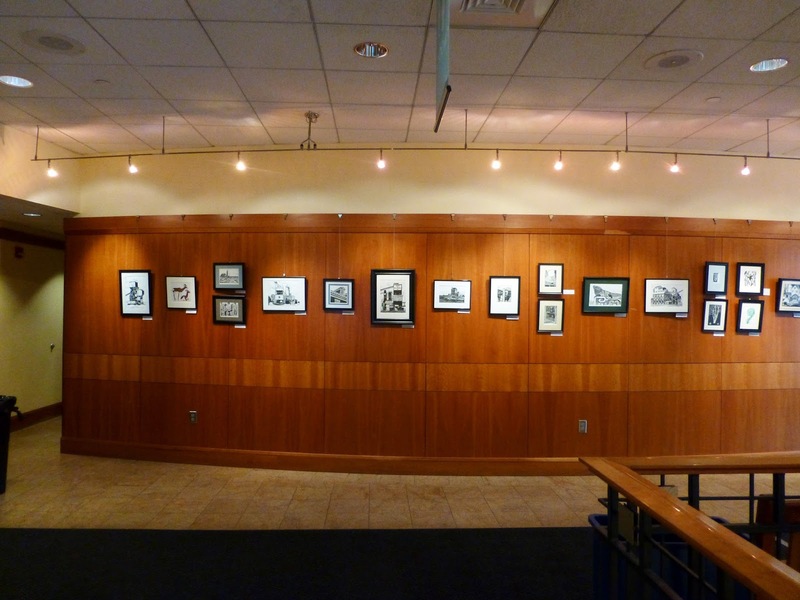 Meanwhile, for the entire month of December I’ll be exhibiting in the Gallery at Wellesley Free Library. My show will be “Around the World” and will include about two dozen pieces that depict real places. I expect that I’ll share more details about the show once I hang it, but I’m looking forward to seeing how it comes together, because I’ve never assembled this particular selection of my work before and it’ll include some of the pieces that I don’t show so often. I’ll be busy in the next month, and you should get busy, too, putting these dates on your calendar, and then getting out and enjoying some local art. I’ll see you there! 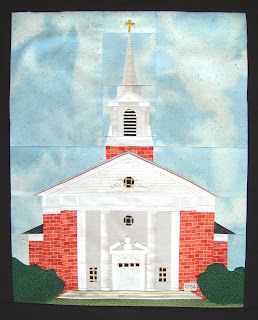 [Pictures: Needham Congregational Church, pieced quilt block by AEGN, 2007. Information about the Village Fair here or here. Grist Mill, rubber block print by AEGN, 2015. Information about Mother Brook Open Studios here. Here is my newest piece, illustrating a hercinia. The hercinia is a bird with feathers that glow and shine at night like fire, and serves as a guide for travellers in the dark forest. Isidore of Seville (Spain, c. 560-636 CE) described them, “Their feathers sparkle so much in the shade that, however dark the night is with thick shadows, these feathers, when placed on the ground, give off light that helps to mark the way, and the sign of the glittering feathers makes clear the direction of the path.” I find this a really lovely idea: the Light guiding us in the darkness, sometimes like a shining beacon, and sometimes just with little clues of Light that mark just one or two steps at a time but keep us safely to the Path… The bird itself glows brightly, but the feathers don’t lose their light when they’re shed but continue to mark the way, even if we miss the bird itself. The birds’ name comes from the forest they inhabit, the very forest that gave us all those fairy tales warning us not to stray from the path. The Hercynian Forest was ancient in antiquity and stretched right across Europe. Now only pockets of it remain of which the Black Forest is probably the most famous. 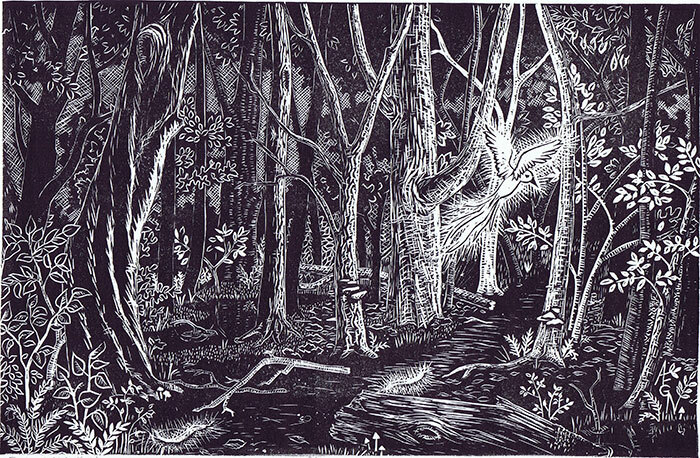 For my illustration of the hercinia I knew exactly what I wanted: the dark, dense forest with shadowed trees tangling themselves into the distance, and the bright bird like a spirit of Light beckoning the viewer in. This was more complicated and detailed than most of my pieces, and the layered shadowiness particularly was a little different from what I’ve attempted before. I used a fine crosshatching to try for a mid-tone between black and white in addition to various areas textured like bark, grass, leaves, moss, etc. For the most part I’m pretty pleased with it. I think the cross-hatching worked best where I had vague shapes in it, as just above the hercinia, rather than the areas of more even cross-hatching, which look a little too geometric. I am pretty disappointed by the feathers along the path, which I think look a bit too much like large, hairy caterpillars. Not that glowing caterpillars couldn’t be good guides, too, of course, but that was not exactly my intention! On the other hand I’m very happy with most of the trees, with their variety of bark patterns, and their texture and shadow. Over all I really stretched my technique with this one and am well satisfied with how it came out. 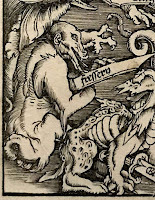 I’m also having fun thinking about what I might say about the hercinia in the theoretical mythical bestiary I’ve been playing with. 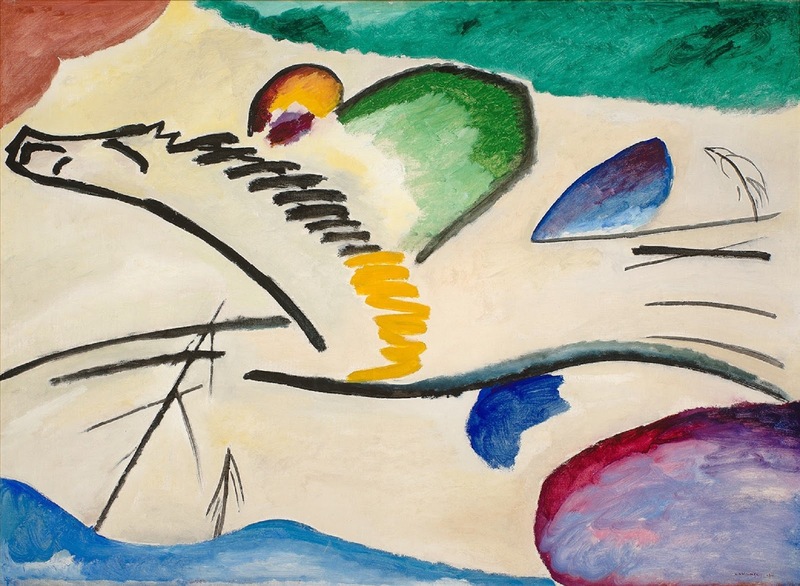 Wassily (or Vasily) Kandinsky (Russia/France, 1866-1944) is generally considered the creator of the first purely abstract work in modern art. Most famous for colorful paintings, Kandinsky also worked a fair bit with wood block prints, in which he explored many of the themes that so interested him, including music, spirituality, and the move to abstraction. In 1913 he published a book of prose poems and 56 woodcuts he’d been working on for several years. It was entitled Sounds and he called it a “musical album,” although most of it wasn’t explicitly about sounds or music - at least as far as I can tell; the poems are pretty abstract, too. 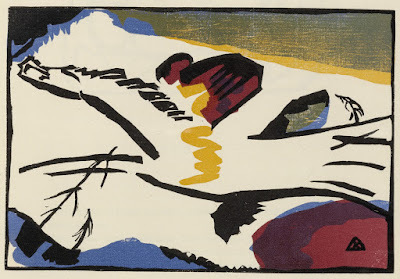 It’s sort of funny that Kandinsky and I share so many similar interests - music, poetry, block printing, spirituality - and yet come to such completely different places. an irony, to use a representational image to symbolize abstraction?) It also seems to me less lyrical and more of a headlong gallop when I look at it as a horse and rider. In any case, it’s interesting to see how this particular piece reproduces a painting from 1911. Or perhaps the painting reproduces the wood block print. Given that the wood block prints for the book were made over a period beginning in 1907, I can’t say whether the painting or the woodcut came first. And I’ve included a couple of other pieces from the book. If I try to find images in the abstract piece above, I can imagine a woman in the lower right, and perhaps more horses along the bottom center and left. But who knows? If Kandinsky’s thought process for this piece was recorded anywhere, I haven’t seen it. The last piece here is quite representational, showing Kandinsky’s interest in Russian folk motifs. I like the pattern on the woman’s dress, and the fairy tale quality of the trees and clouded mountain, and blowing veil. Today is the 500th anniversary of the Protestant Reformation’s kick-off in Germany. 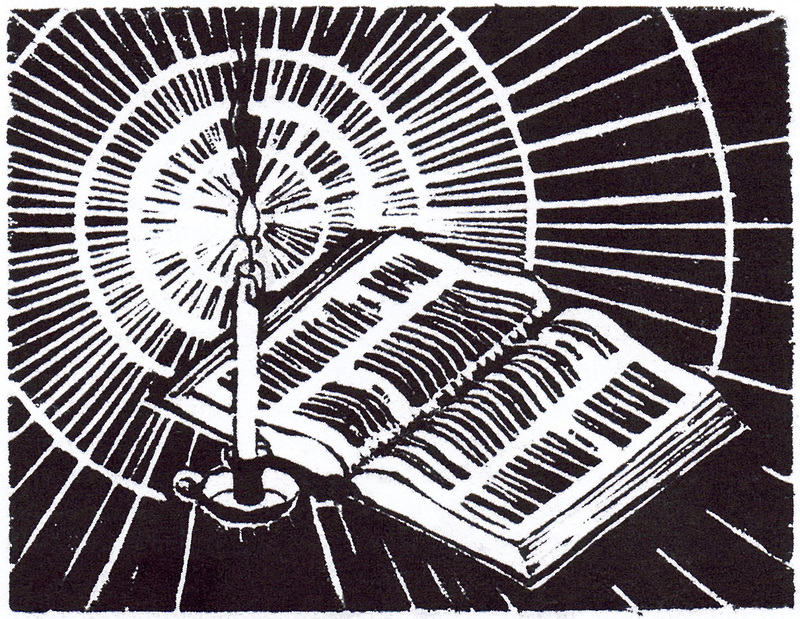 (See the previous post for more on Martin Luther and printmaking.) For purposes of the English language, however, the important Reformation date is 1534 when King Henry VIII declared himself the head of the church in England instead of the pope. 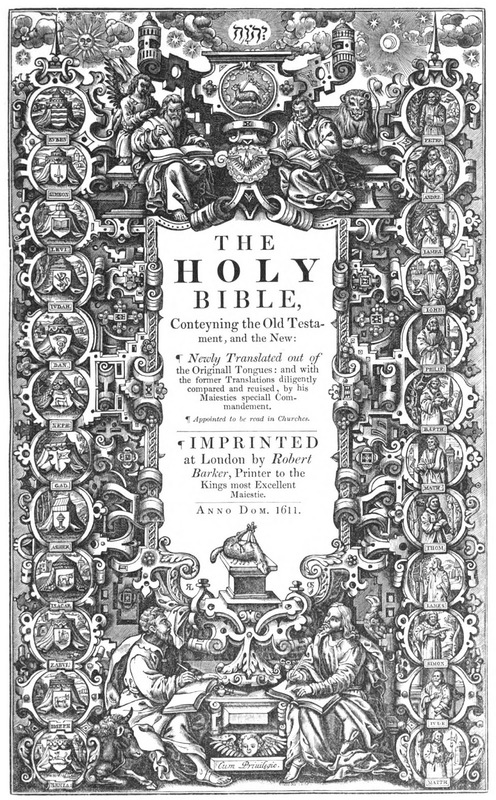 Thereupon Henry ordered the first authorized English translation of the Bible. (Previous English translations had been illegal.) 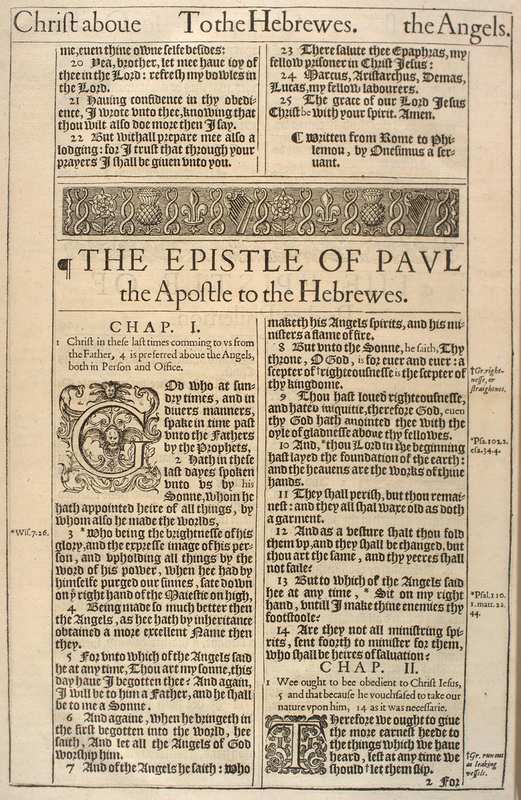 Several English translations followed, but the most famous, long-lasting, beloved, and influential English text of the Bible is certainly the version authorized by King James I. The work began in 1604 and was completed in 1611, and has had a tremendous influence on the idioms of the English language ever since. Contemporary with William Shakespeare, that other paramount influence on English’s catchy phrases, the King James Bible (aka the Authorised Version) nevertheless contrasts widely with Shakespeare’s work. For one thing, its poetic beauty, rather than being the product of a lone genius’s fertile mind, was the work of a committee of 47 scholars and a long process of sub-committees and group decisions. Secondly, where Shakespeare is famed for the wild ingenuity of his language, his huge vocabulary, his gleeful embrace of fire-new words and words he made up himself, the King James Bible was written with a deliberately narrow vocabulary and somewhat old-fashioned language, so as to be sure everyone could understand it easily. Yet its committee of scholars made enduring, beloved poetry with their vocabulary only a quarter the size of Shakespeare’s, and the KJV’s language has become so deeply embedded in everyday English that we quote it unknowingly all the time. But even more telling are those phrases that many people don’t even realize have their origins in the seventeenth century Bible. This is just a small sampling, of course. 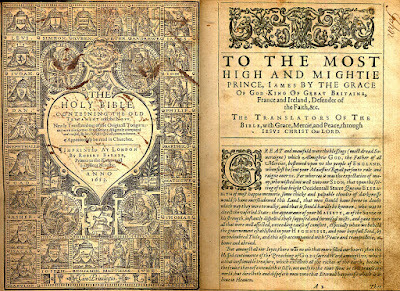 Plus there are many more famous phrases which the King James Bible reused from previous English translations, such as “I have escaped with the skin of my teeth” and “the powers that be.” The translators purposely reused phrasings that were familiar to people when they deemed the meaning accurate and the sound appealing. Although it’s likely that it was the KJV that really popularized these idioms as household words, I haven’t included them in my list because no one can really know for sure. You can see that the phrases I’ve listed are used as idioms, not just quotations, because they can be adapted to different situations. Some of them have had their grammar tweaked to keep up with the language, although I have purposely left out phrases in which the wording in common usage is not substantively what the KJV gave us. 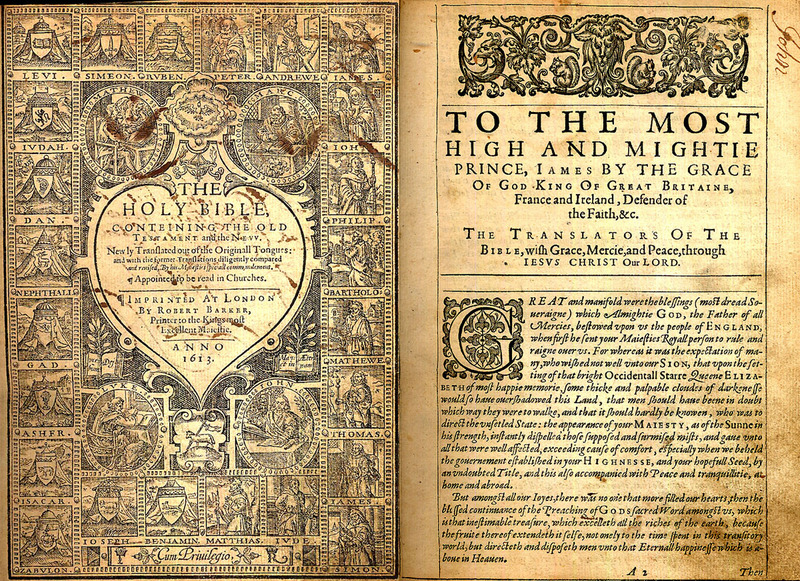 There are lots of English phrases that derive from Biblical stories but which do not use the KJV’s wording, such as “forbidden fruit” and “the writing on the wall,” but the point here is not the influence of the Bible, but the influence of the King James Authorized Translation. It’s significant, though, that many of these idioms can have their pronouns switched for appropriate reference, and can be played with but still have hearers recognize the original phrase, as in, for example, “He’s not his sister’s keeper.” That shows they’re alive and active in the language, not just frozen relics. 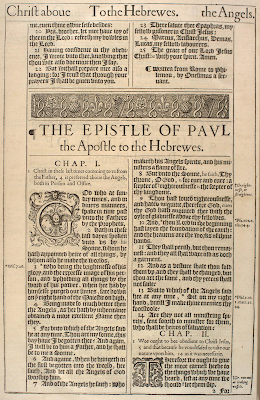 Obviously the King James Bible’s language wouldn’t have influenced English so deeply if the Bible were not such a fundamental part of the culture, but I think it’s also true to say that these Biblical verses would not have remained so deeply embedded in the culture if it weren’t for the power of the KJV’s language. Hallowe’en this year, in four days, is also the five hundredth anniversary of the Protestant Reformation, if you date it from Martin Luther’s public unveiling of his Ninety-Five Theses. (Fun fact: although we’ve all heard about Luther posting his Theses on the church door in Wittenberg, there is no evidence that he did so. This is the date, however, on which he sent his Theses to his bishop.) 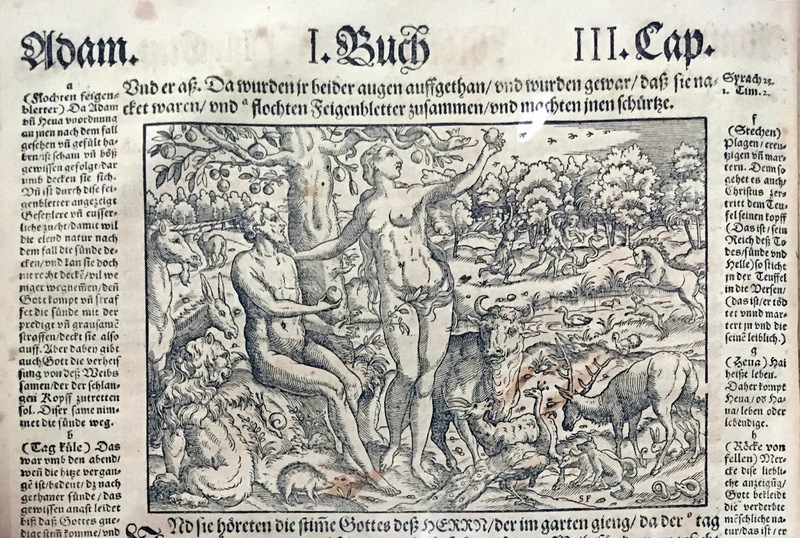 At any rate, soon after Hallowe’en, copies of the Theses were being printed in several towns in Germany, and within the first few months of 1518 copies were being printed and spread throughout Europe. 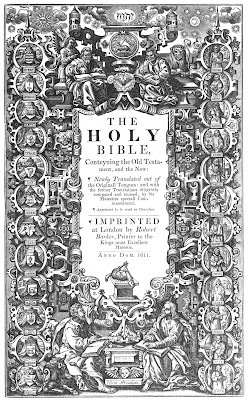 Printing was fundamental to the Protestant Reformation - beginning with the fact that the Indulgences which were the straw that broke Luther’s back were being printed by the hundreds of thousands. 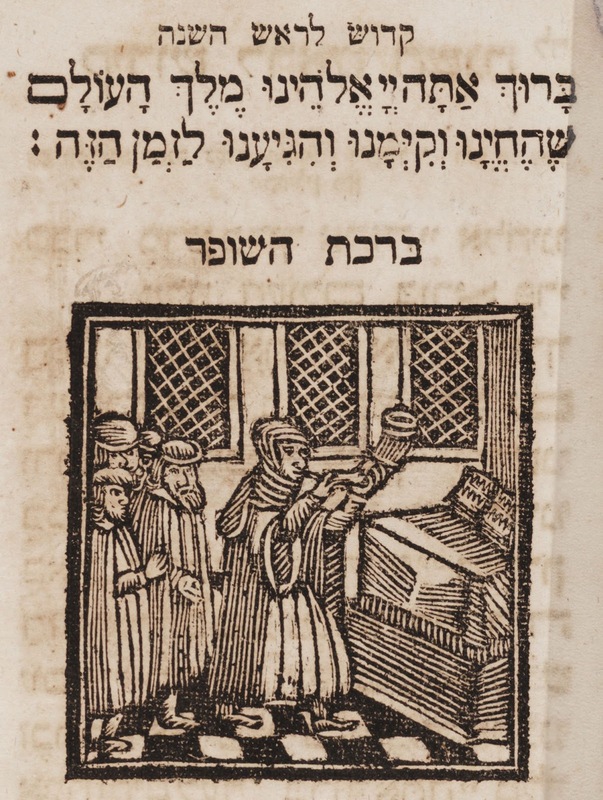 (Fun fact: indulgences were among the first documents printed on Gutenberg’s press; he used the income from printing indulgences to fund his big Bible project.) 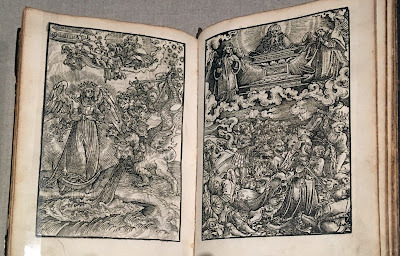 The Davis Museum at Wellesley College currently has an exhibit of printed materials connected with Luther and the Reformation, and I have a few cool examples to share today. 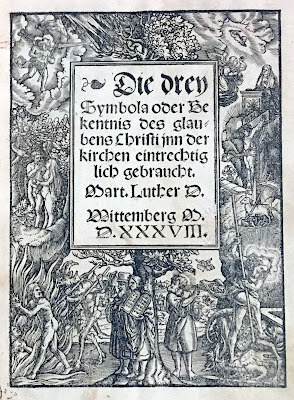 First is the frontispiece of A Collection of Sermons by Luther published in 1538. It’s worth remembering that although the literacy rate was not so high that everyone could read these books for themselves, the number of people the message reached through reading aloud was huge. As for the wood block print, I think it’s gorgeous. This is not a large book and the level of detail is wonderful. The artist, big name Lucas Cranach (c.1472-1553), worked to Luther’s specifications, and the iconography here is all about the principle of “Law and Grace” or “Law and Gospel,” which states that the Old Testament gives God’s law to be followed for ethics, while the New Testament gives God’s grace, which is the only way to salvation (unlike, say, an indulgence). 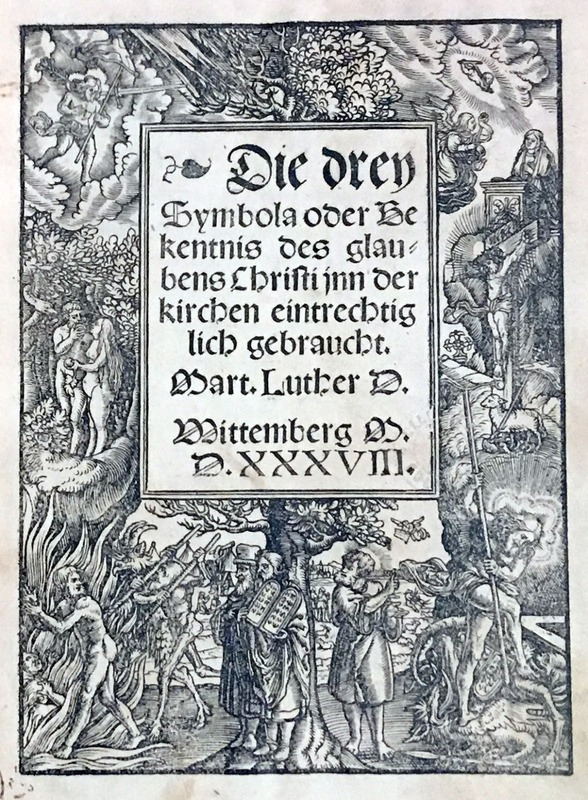 This illustration was another way of spreading the Protestant message to the illiterate, and Luther and artists such as Cranach worked hard to come up with images that would represent their theology. You can see Adam and Eve, Moses with his tablets, and devils casting sinners into the flames, as well as the crucifixion, Christ slaying evil, angels, a lamb, and other Christian symbols. I especially like the tree in the top center getting blasted very dramatically. Next up is an edition of Luther’s translation of the New Testament into German. 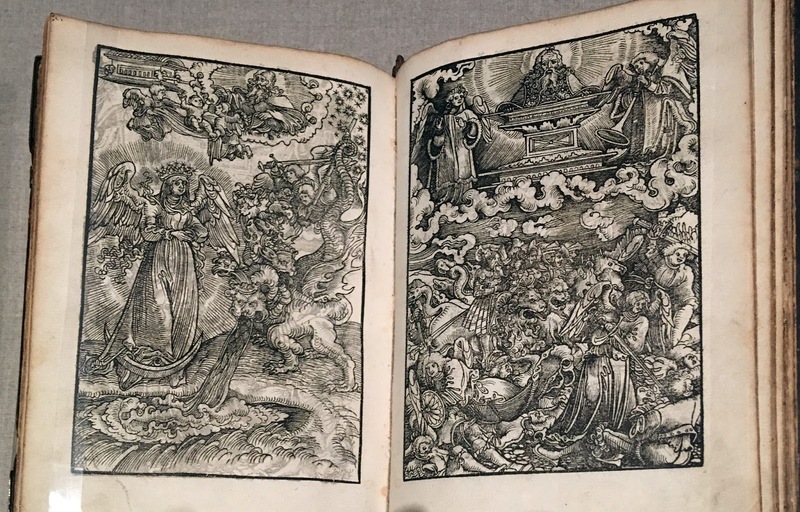 The lush, full-page illustrations here are by Georg Lemberger (c.1495-c.1543) who was clearly inspired by Albrecht Dürer’s series of woodcuts of Revelation. Again, it’s got great details and marvelous monsters, the Ark of the Covenant sailing in on the upper left, unusually happy angels smiting on the lower right… But a particularly cool thing about these images is a flaw: each page has left a ghost image on the opposite page, especially visible in the light areas of the left page. 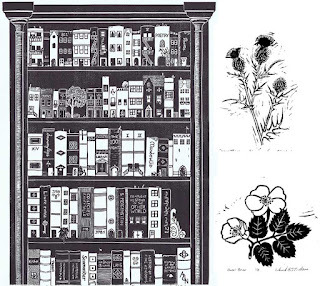 This is because demand for these books was so high and editions were being printed so quickly that the pages were bound before the ink was completely dry and set! 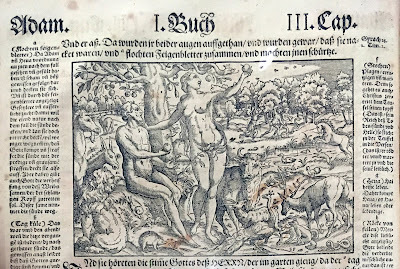 And finally, here’s a nice version of the Garden of Eden, from another edition of Luther’s translation of the Bible. I really like all the animals gathered around Adam and Eve, from unicorn and peacock to hedgehog and snail. I’m particularly pleased that while the Serpent is the villain as always, we are shown an ordinary, uncrowned snake along with all the other happy animals in Eden. 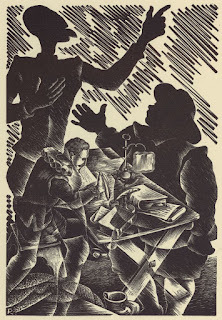 This illustration is attributed to Jost Amman, but I notice that it has initials SF in the block, so I’m guessing another artist must have done it, even if Amman may have been the lead artist for the project. 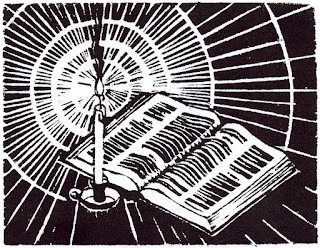 Whatever your theology - or your taste in art - there can be no doubt that the Protestant Reformation is a striking example of the power of printing to spread ideas. I had a terrific weekend at Roslindale Open Studios and am deeply grateful to all the wonderful people (and several friendly dogs) who came by and stopped to talk, to ask questions, and to report that their nephew loves the book or they enjoy my art in their dining room every evening. It means a lot to me to hear that past years’ customers are happy! And of course I also love this year’s customers, and am always pleased to see my “babies” going to good homes. I’ve mentioned before that I especially like selling firsts and lasts of editions, and this weekend I sold out of six prints, which is almost certainly a record for me. 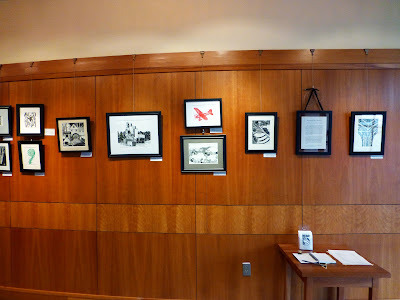 In celebration, therefore, today’s post is a farewell to those six pieces, which have been taken down from the web site, and will never again have to be matted or framed or hauled up from the basement and carried to a show… or carried back home from a show unsold. These six pieces range from some of my very earliest block prints to quite recent, and they represent a range of subject matter. They include some of my smallest prints and my largest ever; simple images and complex, detailed ones. While selling out of these six prints, I carved another block, and made a solid start on carving yet another. I hope to print the first some time this week, and I have to decide whether to continue carving the second, or to save it to work on at my next show. It might be hard to wait that long because I’m pretty excited about this block, and the next show is a month away, so I’m thinking I’ll have to keep carving. I’ll just have to think of something else to work on in November at the Village Fair show. So despite managing to “get rid of” six pieces, I’ll be replacing them just as quickly. Of course, one of the beauties of printing multiples is that I don’t really have to say a final farewell to anything: for every edition I print, I keep one, I give one to my parents, and I sell the rest. I can have my cake and eat it, too. It’s a good life! Tomorrow is Roslindale Open Studios, and on Monday I’m giving a linguistics talk, so I have been hard at work preparing. Today I also have the hard physical work of hauling my display racks, tables, and boxes of books and art up from the basement and packing them into the car for an early start tomorrow. So I thought it would be fun to find a block print of workers hauling boxes, maybe stevedores or construction workers. To my surprise, I couldn’t find what I was thinking of, although I can’t imagine that none exists. 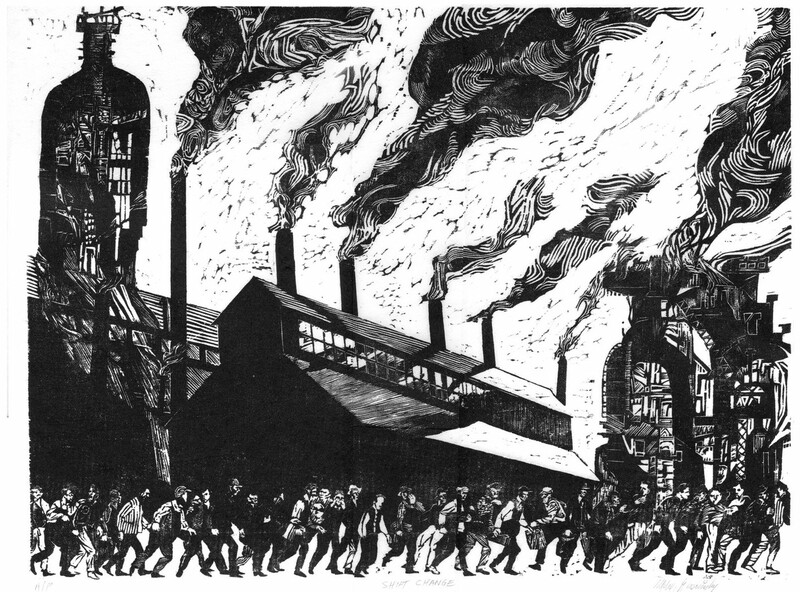 But I did find this wood block print by Mike Goscinsky of Pittsburgh steel workers changing shifts. I really like its mix of detailed realism and abstracted pattern. The building at the center is quite realistic, but the two on the sides look stylized, patterned, and almost doodled. 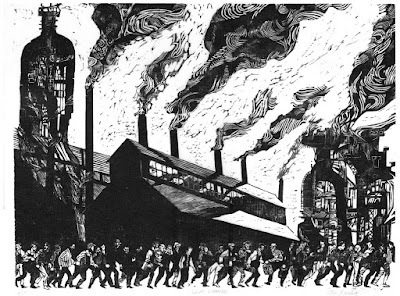 The line of workers are quite finely detailed, while the streams of smoke are boldly patterned. The smoke and sky are especially interesting because the patterns don’t always follow the contours of the smoke puffs. Altogether I find it very striking with lots of wonderful stylistic elements. 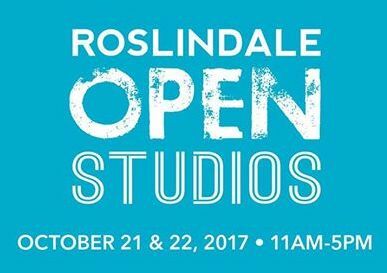 If you’re local, be sure to come to Roslindale Open Studios this weekend. (I'll be at Roslindale House.) It’s always a beautiful show with lots of great buzz, the weather should be unseasonably gorgeous, and I have two new designs to carve that I’m really excited about.